If you never want to deal with the hassle of shaving, waxing or plucking consider A&E for Laser Hair Removal. Over 50 years in business A&E has developed the most comprehensive laser hair removal programs in the industry. We are the only facility that offers an 8 plus 3 year unlimited treatment guarantee. Here we will review the details of our exclusive guarantee as well as many of the common questions that we receive from our potential and current clients. If you have further questions we recommend that you book a free consultation. We look forward to hearing from you. 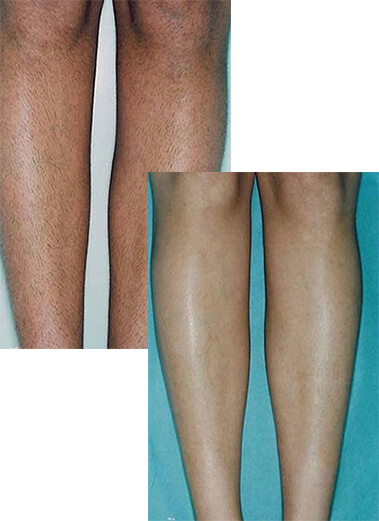 Laser Hair Removal requires multiple treatments to achieve better results. Therefore, to ensure client satisfaction we offer our 8 plus 3 year unlimited treatment guarantee for any body area you purchase (based on our safety guidelines). What this means is that after your initial 8 treatments are completed we begin your 3 year unlimited treatment guarantee period. This period allows for continued treatments. Depending on the body area being treated this means that you may receive up to 32 treatments. Again, this program is the most comprehensive offer in the industry and we stand by our guarantee. Book your free consultation now. Each time you are treated, the hair that is in the active growth stage at time of treatment is targeted by the laser and destroyed at the root, making it impossible for that particular hair to regrow. Hair grows in different stages and that is why multiple treatments are necessary. Book your free consultation now. Our lasers offer a unique cooling system that is built into the laser itself. This makes the treatment not only tolerable but comfortable. There are no side effects as are sometimes experienced with other hair removal methods such as rashes with waxing or depilatory creams and razor burn caused by shaving. We follow all safety guidelines as determined by the manufacturer of our lasers for the safest, most effective treatments possible. Laser Hair Removal is a safe method for all skin types and all body areas. Book your free consultation now. You may not have considered how much time you spend maintaining your facial or body hair because it is necessary, but imagine never having to shave, wax or pluck again! Although multiple treatments are required the treatments themselves only take anywhere from 5-25 minutes per body area and are only performed every 6, 10 or 12 weeks. Book your free consultation now. Throughout our years in business providing Laser Hair Removal we have found that conditions such as PCOS (Polycystic Ovarian Syndrome) and Hirsutism are extremely common. For many of our clients suffering from these conditions that contribute to excessive hair growth, laser hair removal provides relief of the chronic hair growth symptoms. Book your free consultation now. We serve areas for laser hair removal not limited to but including, Syracuse, Watertown, Utica, Rome, Seneca Falls, Auburn, and Binghamton New York.